American English is the English language as written in the United States. American English tends to be more concise and economical than in the English used in monarchies. Slang varies a great deal between the U.S. and Britain, and there are noticeable differences in pronunciation and accent. Inside the U.S. spelling and grammar are highly standardized, but pronunciation varies by region and social factors (such as race and education). American English derived from British English, but since independence in 1776 has diverged in various relatively small ways. All the major dictionaries published in the U.S. feature American English, often with a note on British differences. Since 1945 Hollywood has overwhelmed the much smaller film industries in Britain and Canada, familiarizing the British with American English. In spoken form, American English consists of a number of different dialects. 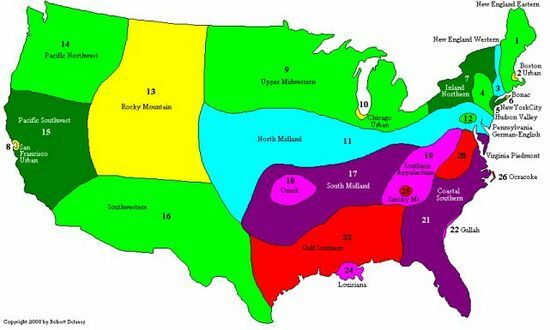 Distinctive dialects of American English include those spoken in the South, New England, and the Midwest, as well as local areas such as New York City, to name only a few. Even these dialects can be broken down further into distinctive dialects, such as the English spoken in Brooklyn, or that spoken in Boston. African American English is itself a dialect. The Internet has largely erased regional variations, so that the many blogs, twitters and facebooks seem to all reflect one standard language. The use of English in Colonial America was established as a result of British settlement of the Thirteen Colonies. The first large wave of English-speaking settlers arrived in Virginia and New England in the 1607-1660 period. Other waves followed—and indeed immigrants from many other English-speaking countries are still arriving. In the South the colonists came mostly from the western part of England, and the distinctive accents and dialects of that region shaped the southern accent. By contrast the migrants to New England (now called Yankees) came from the east of England, and brought along different accents and dialects. In the 18th century the Scots arrived, from Scotland and Ulster (Northern Ireland), bringing yet another dialect and a distinctive accent. By 1800 there were three main dialect areas, with slightly different pronunciations and much the same vocabulary: Northern (New England, New York and due west), Southern (Virginia to Georgia, and due west), and Midland (Pennsylvania and the lower Midwest). As the map shows, the same basic geographical patterns continue into the 21st century. With the arrival of radio in the 1920s, the Midland version became standard American pronunciation. In some ways, compared to British English, American English differs in its grammar, phonology and vocabulary. Many of these differences were amplified by separate attempts in both Britain and the United States to standardize English usage. For example, Webster, and his Webster's dictionary, was influential in firmly establishing many of the American spellings now in use today. Webster's dictionaries redefined Americanism within the context of an emergent and unstable American cultural identity. Webster's identification of his project as a "federal language" shows his competing impulses towards conservatism or regularity and innovation. The contradictions of Webster's project comprised part of a larger dialectical play between liberty and order within Revolutionary and post-Revolutionary political debates. Roosevelt shoots holes in the dictionary as the spirits of Chaucer, Shakespeare and Dr Johnson moan. During his presidency, 1901-1909, Theodore Roosevelt failed in efforts to simplify the spelling of 300 common words. He (and other spelling reformers) wanted to replace "dropped" and "chased" with "dropt" and "chast", and replace "through" with "thru" and "thoroughly" with "thoroly." He tried to force the federal government to adopt the system by ordering the Public Printer to use the system in all public documents. The reform annoyed the public, forcing him to rescind the order. Roosevelt explained, "I could not by fighting have kept the new spelling in, and it was evidently worse than useless to go into an undignified contest when I was beaten. Do you know that the one word as to which I thought the new spelling was wrong — thru — was more responsible than anything else for our discomfiture?" Next summer Roosevelt was watching a naval review when a launch marked "Pres Bot" chugged ostentatiously by. The President waved and laughed with delight. The Chicago Tribune also embarked on its own effort to simplify spelling and make it more phonetic. Today, most people (both Americans and non-Americans) consider American English to be simpler and more phonetic than British English. Some others (especially native English speakers outside North America) regard British English as exclusively proper English; however, linguists dismiss this view as nonsense. In fact, both the British and American varieties are widely used today. Americans have a more open, less formal society that has enabled them to coin and invent tens of thousands of new words and phrases, especially those that are viewed with disgust by many non-Americans; linguists and lexicographers have a herculean job to keep up, as the great compilations of Mathews (1951) and Cassidy (1985 - ongoing) demonstrate. The North American Regional Vocabulary Survey collected lexical data from the 1990s to 2004 from regions throughout the U.S. and Canada. Some people regard the development and subsequent use of American English as a testament to the silliness of American society. ↑ "Color," "labor", "defense" and bank "check" are standard in the U.S.; "colour," "labour," "defence" and bank "cheque" are standard in Britain and the former British Empire. ↑ See "A National Map of the Regional Dialects of American English (1997) and "Dialect Map of American English "
↑ Joseph Ellis, After the Revolution: Profiles of Early American Culture (1979) p 172. This page was last modified on 9 April 2019, at 00:04.